Tania: Masks and Trophies: Photographic blow ups installation of the five identities adopted by Haydeé Tamara Bunke, also known as Tania, La Guerrillera, the only woman who fought together with Ernesto Che Guevara in Bolivia. The large size images are shown suspended in the air by a system of wire and metal supports that are then anchored with counterweights to the floor, seeming to float like banners in the gallery space. In 2007, I decided to return to the theme of the last Che campaign in Bolivia in 1967, questioning the idea of clandestine identities with a series of works and accumulative installations that were started in 1987 for Project For The Day You'll Love Me. 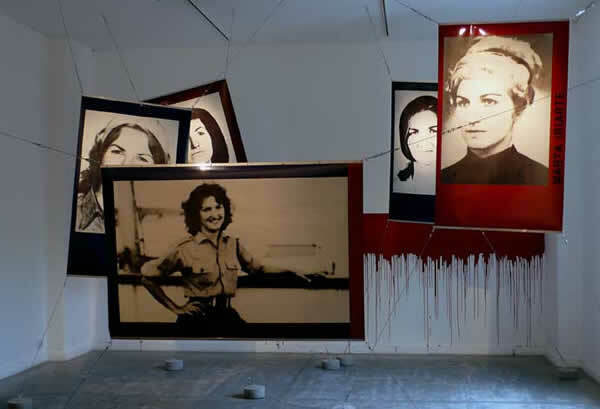 In returning to the character of Tania, a work that was first developed in 1995, the installation includes questions on the whereabouts of the photographs taken by the guerrillas themselves during their eleven months in Bolivia, which were confiscated by the Bolivian military after their capture and death. This aspect of the installation is presented as a mural work that includes quotes and visible evidences of the commercial use of the guerrilla's iconography, such as it was documented by Tania, Che Guevara and other members of the tragic campaign of 1967. 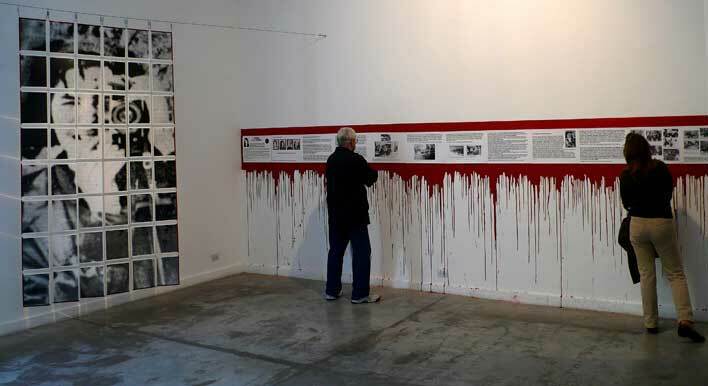 The exhibition also includes a 40-minute cycle projection of Exhumación, an interview with Alejandro Incháurregui, founding member of the Equipo Argentino de Antropología Forense (EAAF) which, together with a Cuban team of researchers and anthropologists, was in charge of finding the remains of Ernesto Che Guevara and his companions in 1997. Tania: Masks and Trophies was shown at the Centro Cultural Recoleta, Buenos Aires, 2007, curated by Clelia Taricco. Notes: From a series of accumulative installations for Project For The Day You'll Love Me, 'Tania' was shown for the first time at El Museo del Barrio, 1996. Julia P. Herzberg, curator. At the Chicago Art Institute, Betty Rymer Gallery, 1998. Rachel Weiss, curator, who also included 'The Gaze' installation. 'The Gaze' was also shown at the VI Havanna Biennial, Cuba, 1997. Curators: Ibis Hernández Abascal y Margarita Sánchez. Directors: Llilian Llanes Godoy y Nelson Herrera Ysla.